The Book Guardian: Captain Planet, he's our hero! By now you should know that we're trying to save the planet. There's been a HUGE interest in the last few years about going green. I've always tried to recycle and be eco-conscious, so I'm all in favor of this movement. I can't build a completely green house and bike everywere, but there are things I can do. If it fits me, of course. A little over a month ago, I decided to make more an effort to take my lunch to work everyday. Mostly, it's healthier and saves me money. I used the plastic grocery bags as my lunch bag and tried to convince myself I was recycling by using twice before throwing them away. I toyed with the idea of getting a lunch bag, like I had in grade school, but that just seemed so lame. Doesn't lunch just look so much more fun in this box? It makes me happy. 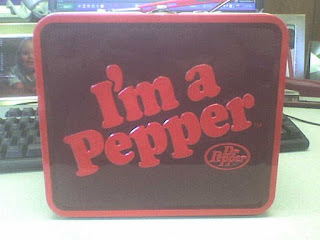 Then Fran (completely forgetting that I showed her my lunch box before and all she said was "I don't like Dr. Pepper") showed me this site today, and I really want this one, among others. Like purses and shoes, I need lunchboxes for every outfit! Just kidding. For now. . . Since the grocery bags were starting to pile up, I knew it was soon time to invest in reusable grocery bags. Today, picking up lunch fixings at Giant, the bags were everywhere, and I knew that their time was now. I asked for two, thinking I might really need three or four (which is how many plastic ones I would have used), and all my groceries fit in one and a half! Brilliant! They are even kind of cute! When I first moved here, the Giant near my house was kind of scary. Dingy, dirty, small-ish, and not the best selection. I often went to Safeway for my major grocery shopping and only went to Giant when I'm in a rush. 1. They've completely re-done the store. Much bigger selection than before, including locally grown produce, brighter, larger, and much more inviting. 4. Discounts when you use the reusable bags! Yay! I saved 20 cents today! So, I'm saving money and the planet and looking good doing it. Sweet. Kudos! 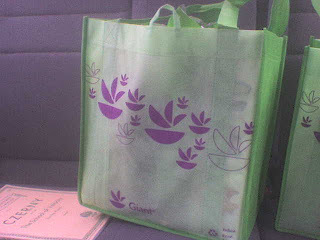 I did the environmentally-unfriendly plastic bags to hold my lunch....tsk tsk and shame on me. We used to have one of those insulated lunch bags, but it got stolen at Joel's school - who steals a lunch bag, honestly?!?! Anywho, you've inspired me to do better. :) Thanks. What are the dimensions on your reusable bag? I'm thinking I could make them for Christmas presents or something.